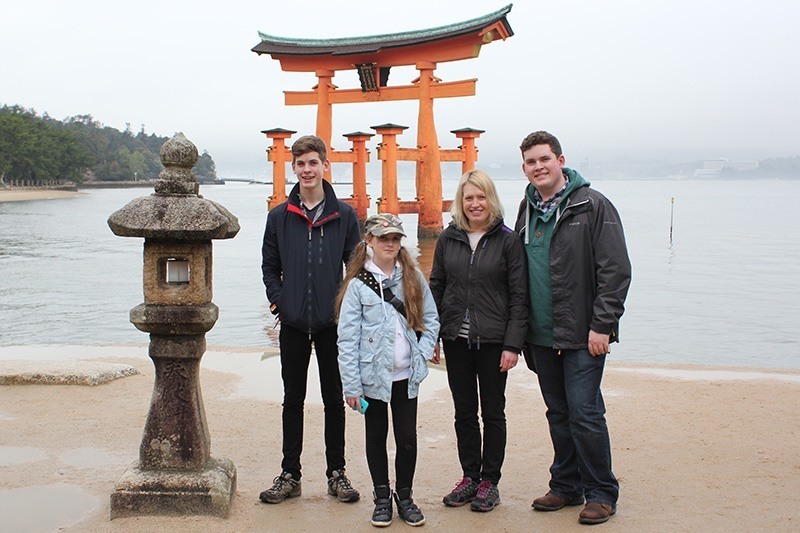 Janne Ford and her family recently visited Japan at peak cherry blossom time, taking in the shades of pink in Tokyo, Hakone, Kyoto, Hiroshima and Takayama, giving them a good taster of the country. It is often quite a task for anyone planning a family holiday, to get something that everyone in the family will enjoy, but Japan easily came up with the goods for Mum, Dad, the 18 and 16 year old lads and 11 year old girl. 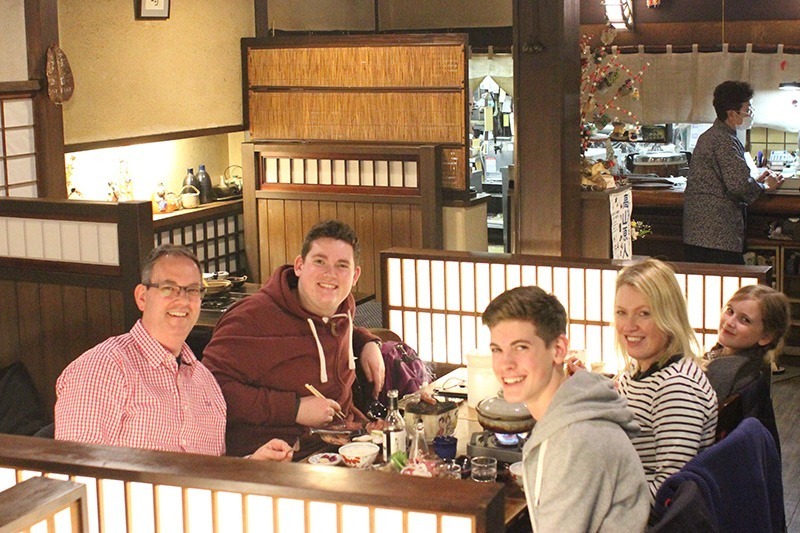 Enough from me, here’s Janne and the Ford family Japan adventure and their guide to family travel in japan. As I sit here writing on this showery April day I wish I could be transported back to that first exciting afternoon at Zozo-ji temple, just ten minutes walk from our hotel at Shiba Park. Blue skies and cherry blossom…. everything we could have hoped for on our first day in Tokyo. Everywhere we looked was a visual feast. With Tokyo tower making a dramatic backdrop to the temple and the smoke wafting through the cherry blossom from the huge incense burner, it was difficult to know where to look first. I spotted someone in a kimono; the boys spied ‘pocari sweat’ in a vending machine. As is the way with our family, camera phones were out and we instantly split in several different directions! We only had a few days to spend in Tokyo. The city is vast and we realized we couldn’t possibly see everything on our list. 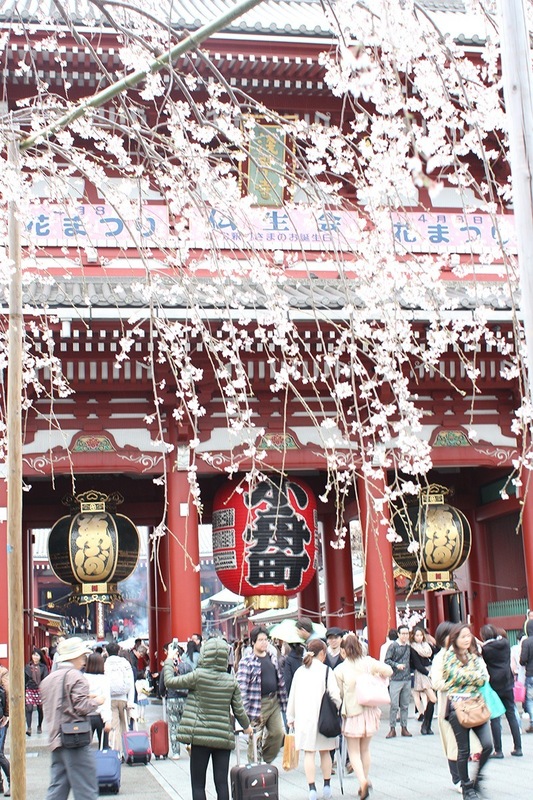 We decided to investigate Asakusa, home to Tokyo’s most sacred temple. We all loved it. Not only is the temple simply spectacular in terms of its colour, its garden, its pagoda and shrines, but also for the hustle and bustle of the surrounding ancient streets full of traders, tourists and worshippers. It feels authentic and timeless to visit shops that only sell hairpins or paper crafts – or to take a ride in a rickshaw through the back streets eating a green tea ice cream! We chose a tiny restaurant at random for lunch and were shown to a table for tempura. It seems to be the area for tempura restaurants and it was delicious. We are all still craving it! 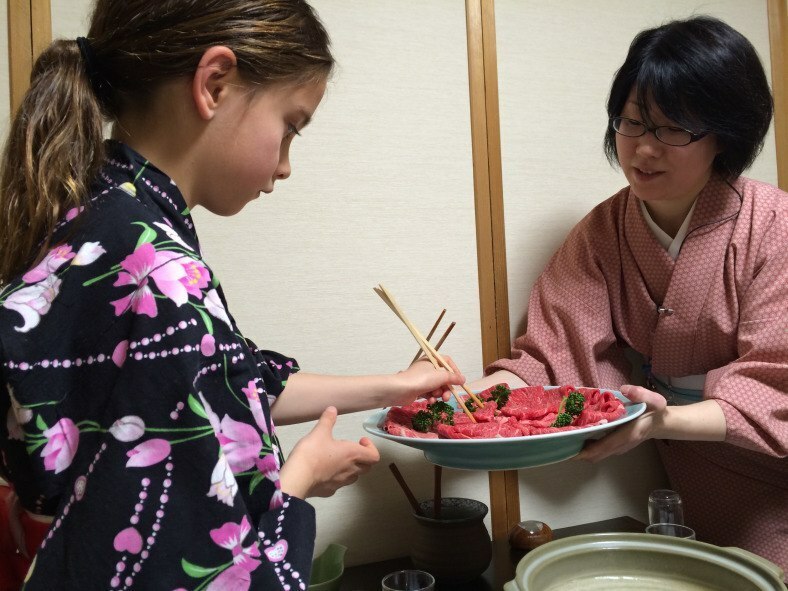 Whilst in Japan, we wanted to experience an authentic stay in a traditional ryokan. For this, the Ichinoyu Gora in Hakone, our next stop, was perfect. With paper screens, roll-out futons and cotton yukata to wear, we were all set for the ryokan experience! We all agreed that the food was amazing. Would we choose rice and miso soup for breakfast at home? No, definitely not! But at Ichinoyu Gora, a tray full of exquisitely presented pickles, algae, fish, rice and steaming bowls of miso made a perfect start to the day. That and the hot spring tub on our balcony! We have to thank the InsideJapan Info-Pack for recommending a bakery just down the track at Miyanoshita though. Our Western cravings for something doughy and a cappuccino had kicked in by mid morning. Although Mt Fuji was shrouded in cloud during our visit, we still took the cable cars to the viewing area and visited the Hakone Outdoor Sculpture Park on the way back. This has to be one of the best art museums we have ever been to. The mountains make a dramatic backdrop rain or shine; this is an easy way to spend a day with children of all ages and has the added bonus of a large canteen-style buffet restaurant with western food options for those craving it. Kyoto was our next stop and again we had opted for an authentic experience in a traditional Japanese house rather than a hotel. We had booked for a guide on our first morning, and the lovely Kimmee took us to the beautiful Nijo Castle. 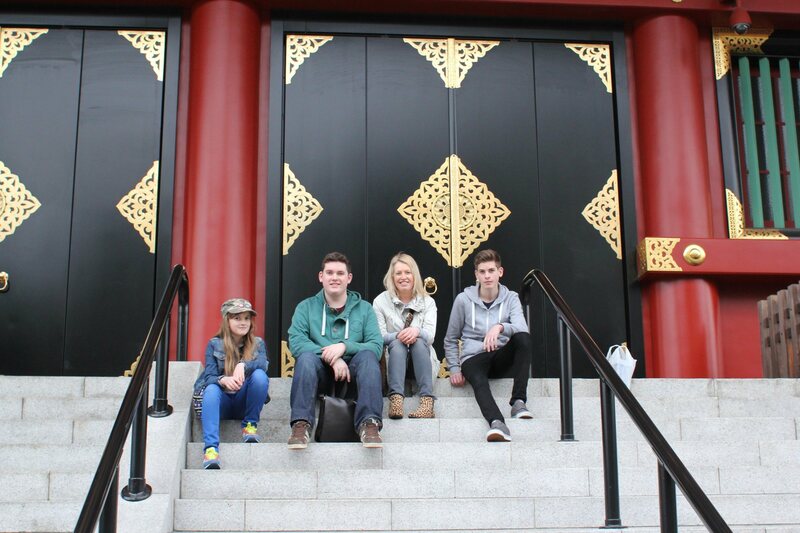 She was very knowledgeable and we learnt more from her about the history of Nijo than we would have by going it alone. After the castle, she took us to a kimono shop in the old part of town (because we asked) and recommended a lovely restaurant for lunch. We had long planned to visit Himeji Castle from Kyoto, and we were just so lucky that our visit coincided with the reopening after years of refurbishment. About an hour away by train, the ‘white egret’ castle is stunning, particularly when surrounded by blossom and blue skies. 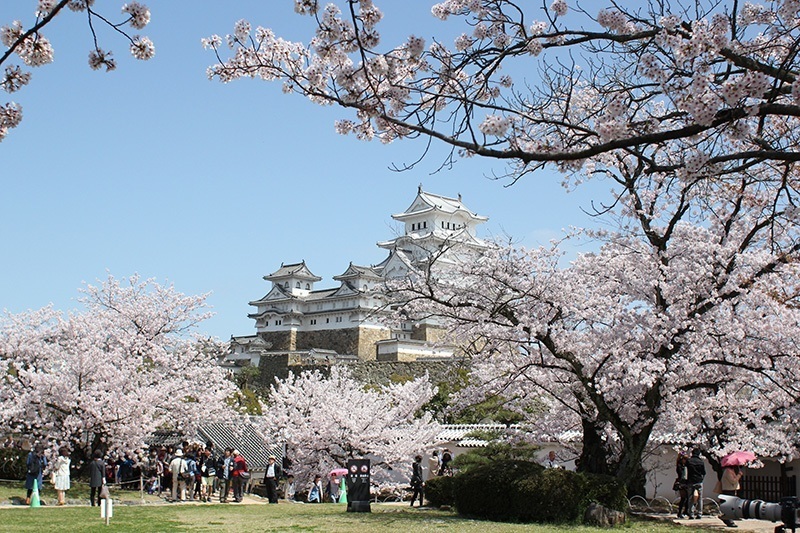 As it was the weekend, hanami (flower-viewing) parties were in full swing, but we braved the crowds and all the wonderful distractions and headed straight for the castle. We weren’t disappointed – it was one of our most memorable days in Japan. Of all the cities we visited, we felt we could have spent longer in Kyoto (Kyoto Station itself is worth spending a good couple of hours in). Unfortunately, our two days were soon over and it was time to head back to the station and on to Hiroshima and Miyajima Island. My 16-year-old would say this was his favourite place. The Peace Memorial museum was ‘eye-opening’ and very poignant. Whilst my husband and teenage boys were totally absorbed in the history, it was too much for our 11-year-old daughter so we whiled away the time in the Peace Park. Whilst you couldn’t have a trip to Hiroshima without acknowledging the absolute devastation of the past, the city has so much else to offer in terms of restaurants and shopping and we had lots of fun here. Miyajima Island, just a short ferry ride away, was a real highlight of the whole trip (and the main reason we chose to stay in Hiroshima). Again, shrouded in mist, (we never saw the top of the mountain here either) the island is picture-perfect with the torii gate and Itsukushima Shrine being the main draw. 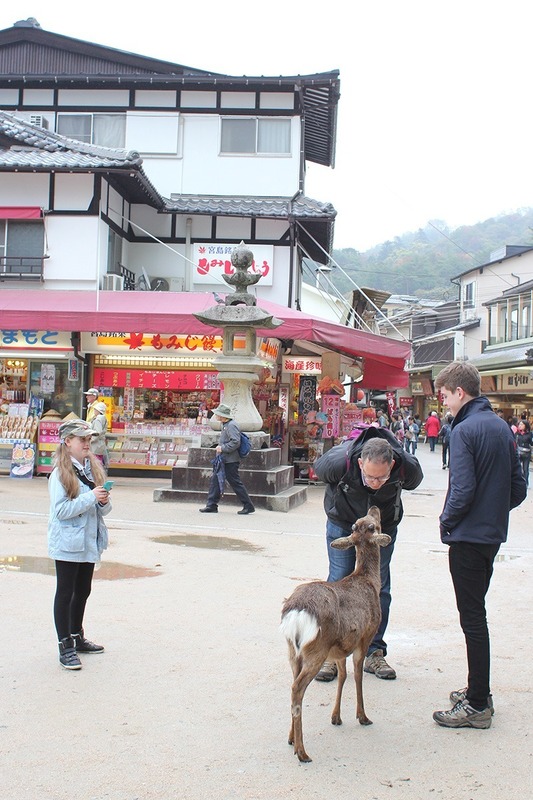 The tame deer that eat anything (including our map) wander amongst the tourists, and the craft shops are filled with lovely artisan products that we hadn’t seen on the mainland. Away from the touristy waterfront, the Misen trail takes you to Daishi-on temple, which is as intriguing as it is beautiful. We reluctantly left Miyajima Island at nightfall and headed back to the mainland. Takayama was our home for the next two days. It was refreshing to leave behind the urban sprawl for a smaller town. We opted not to visit any temples whilst here as everyone was a bit ‘templed out’, but instead concentrated on the Hida Folk Village, which was great for kids. We were slightly out of season so seemed to have the place to ourselves. However, it had snowed that morning which may have had something to do with the lack of other tourists! We kept warm by making our own souvenirs in the craft centre. Again this was a really enjoyable hour or so, learning from two local women and chatting about the town. Sadly, our holiday was nearly at an end and it was back to Tokyo for another two nights. 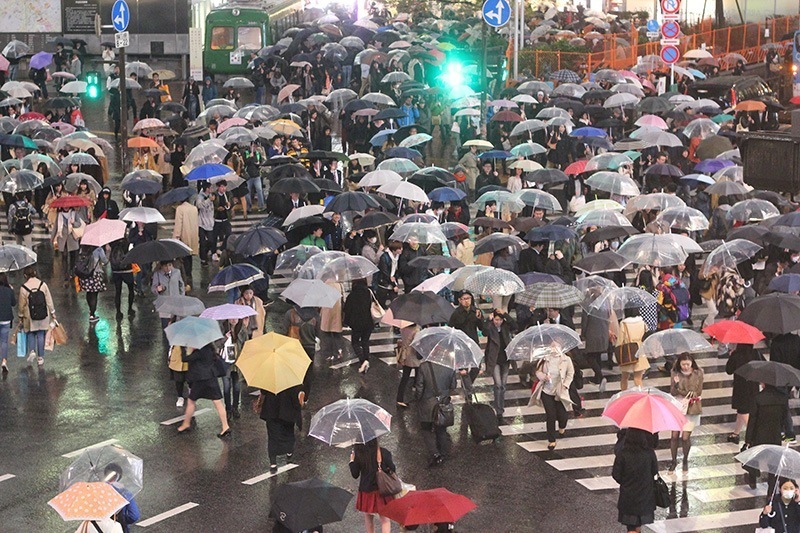 This time on the Shinjuku side of the city, which is all bright lights and nightlife. To make the most of our last day, we followed an InsideJapan suggested itinerary from the Info-Pack, which took us back to Asakusa (more souvenir shopping and tempura) and a trip down the river. We finished the evening in Starbucks with our noses and cameras pressed to the window watching the madness of the famous Shibuya crossing. We left Tokyo knowing we couldn’t physically have packed any more in to the two weeks. 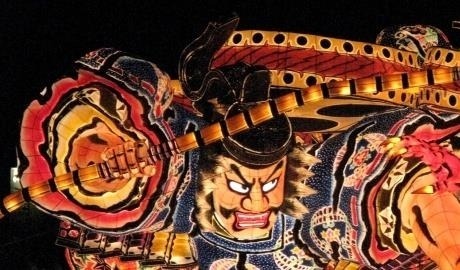 I have only mentioned just a few of the highlights from each place and the InsideJapan Info-Pack proved invaluable for all kinds of tips and ‘must-sees’. There are countless more and we left Japan knowing we must go back. There is too much yet to be discovered! 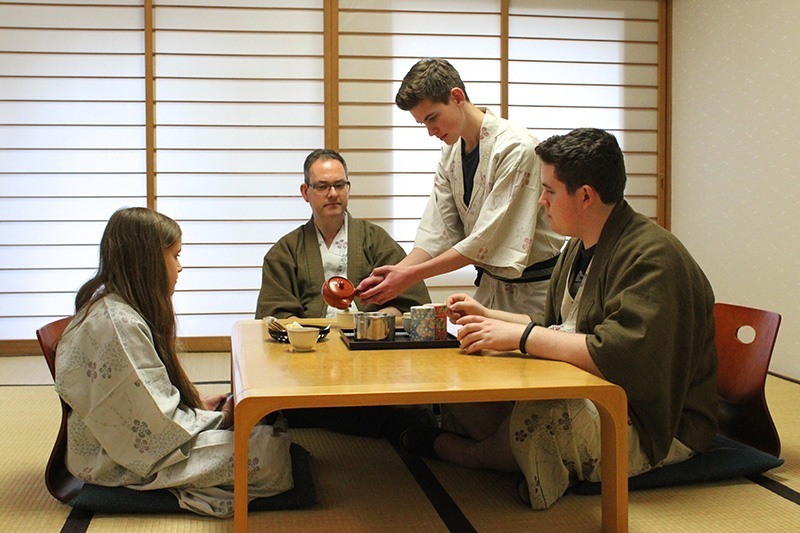 If you’ve been inspired by the Ford family and would like to book your own family adventure in Japan, click here to find out more about our recommended family itineraries such as our Hands-on Japan small group tour or our Family Summer Beach Holiday.